“Apollo and Diana” – a picture on mythological themes. Apollo, in Greek mythology the son of Zeus and the Titanides of Latona, twin brother of the virgin goddess of hunting Diana. He was considered a deity, a prophet, a luminous patron of the arts. Diana, the beautiful sister of Apollo, was the goddess of the moon and the hunt. In works of art she is usually portrayed as a beautiful girl dressed in short dresses of a hunter, with a bow in her hand and a quiver full of arrows, on her side and with a crescent on her proudly planted head. Often, a deer is depicted next to the goddess. The plot of this picture served as an ancient Greek myth. Niobe – the wife of King Thebes had seven sons and seven daughters. She was filled with pride and went so far as to forbid her people to worship Apollo and Diana and even ordered her whole kingdom to throw their statues off the pedestals and smash them. She also offended their mother, the goddess Latona, and did not want to sacrifice her. Then the angry Apollo and Diana set out on their journey. Apollo, seeing that the seven sons of Niobe hunted in the forest, killed them with their arrows, which never flew past the target. Only Niobe was shut up, as the bell of Diana’s bow was heard ringing, arrows flew and all daughters fell… Niobe stood, surrounded by the bodies of sons, daughters and husband. She was numb with grief. The wind of her hair does not sway, her eyes do not shine with the life, only tears flow from them. Petrified Niobe and stormy whirlwind moved her to her homeland in Lydia. There, high on the mountain Sipile is Nyoba, facing the stone, and always shed tears. Such a sad legend. The picture “Apollo and Diana” shows the moment when Apollo shoots arrows. The faces of the gods are completely impassive, they brutally avenged the mortal woman. 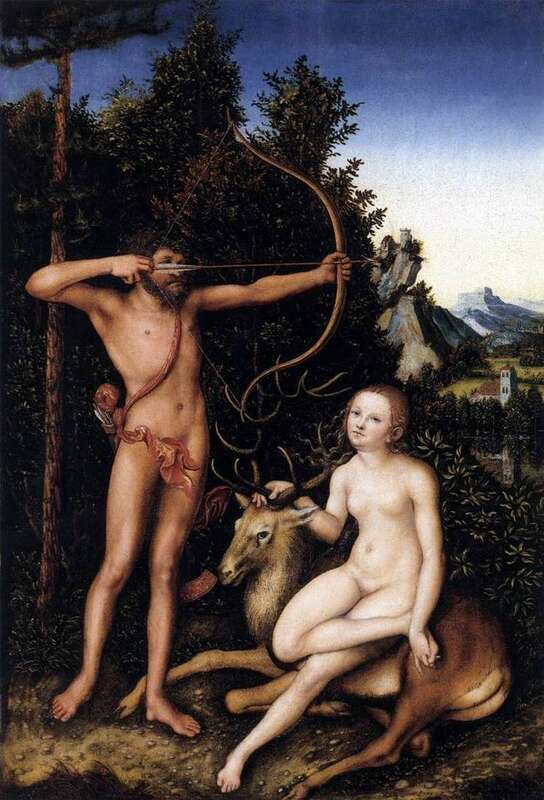 Description and meaning of the painting Apollo and Diana by Lucas Cranach.